Review C » By the book or buy a book? “My wish is to be a citizen of the world” — and although the world did not always understand him, the man who in a tormented age had expressed this irenic desire has since become such a symbol. Erasmus sounds familiar, centuries after his death in 1536. A model of scholarly erudition, subtlety and wit, he was the most perceptive and nuanced Christian humanist of all times, a champion of Gospel truth, but also of classical antiquity, a truly unprecedented defender of peace, and a prodigy at making compromises without once compromising himself. To honour him, Museum Boijmans Van Beuningen introduces Erasmus of Rotterdam to the wider public through other means than the philosopher’s words. Within the context of global ethnical uncertainties, this event has a definite place in the greater Dutch venture of national self‑defining. Similar missions have pervaded Western Europe for quite some time, but the process was jumpstarted in Holland by the murders of right‑winged popular politician Pim Fortuyn in 2002, tragically followed by film director and enfant terrible Theo van Gogh two years later. 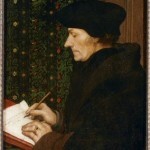 Since then, the Dutch cultural canon was released in 2006, and now is indeed an opportune time as ever to remind the world that Erasmus’ exceptional abilities for elegant negotiation, his disdain for worthless complications, the intelligent critique of society and Church, and his open‑minded theology are trademarks of subtle Dutch attributes throughout history. The successful “polder model” which governed politics during the late 80’s and prosperous 90’s, the Netherlands’s world‑famous tolerance and diversity of opinions, the hosting of an International Court of Justice are all reflections of Dutch qualities that rise up to an Erasmian heritage. In trying to go beyond biographical prose, Images of Erasmus provide visions of history as portrayed by the paintbrushes, chisels and gravers of Renaissance artists. Sponsored by the Dutch government and under the main tutelage of the Erasmus University Rotterdam, this event is much more than an average art affair; it is a considerable interdisciplinary enterprise, primarily distinguished by a collection of renowned works of art. Some of these were exceptionally borrowed from across the world and displayed in The Netherlands for the first time. Notwithstanding a little pride, the museum reveals to the public that even the Louvre has waived its usual policy and agreed to lending Holbein the Younger’s famous portrait of Erasmus for temporary display in Rotterdam. Images of Erasmus, Museum Boijmans Van Beuningen, Rotterdam. The scholarly material contributing to the exhibition greatly complements the works showcased, from the richly illustrated catalogue, to the dependable and freely available exhibition booklet, which provides brief comments on many of the 150 pieces on display. The first chapter of the catalogue by event curator Peter van der Coelen cleverly builds bridges between various paintings and the philosopher’s own views regarding portraiture work and its appropriate functions. Erasmus viewed paintings as welcome reminders of his various friends, and he also occasionally sent his own portraits to close acquaintances; one such example available is a diptych signed by Quinten Massys, sent by Erasmus to British humanist Sir Thomas More in 1517. It is ironic that we do not find out from the exhibition booklet that Erasmus had little, if any interest for the great art being produced in his lifetime. While in Florence and Rome, he paid no special attention to either Raphael or Michelangelo, and although nine months were further spent in Venice, no cerebral glance of his certified the merits of Carpaccio, Bellini or even Titian, as they all apparently failed to impress this transalpine man of letters. Concurrently, although we are informed that Erasmus maintained contacts with famous artists, what remains unmentioned is that these connections were of practical nature (reflecting his need for portraitists), since he did not generally share their aesthetic values. The curator tried to go around these potentially thorny matters by either ignoring them or focusing on several exceptions. The first area of the exhibition is dedicated to portraits of Erasmus, in consonance with the event’s overall purpose, namely “to bring the great humanist closer to us [by] focusing less on the word, and more on the art of the period 1450‑1550″. Probably aware of the risk of generating an interesting, yet not very Erasmian Renaissance art collage, the remaining four themes of the exposition are cleverly set along lines inspired from the great philosopher’s views on education and scholarship, war and peace, church and religion, while also representing his famous Praise of Folly through works of art. However, lacking considerable knowledge of both Erasmus’ humanist career and the Renaissance, and without an equally considerable amount of patience, the average visitor might literally lose himself in a labyrinth of vaguely related paintings, engravings, sculptures and manuscripts. In a declared attempt to emulate Erasmus’ skill at demonstrating that everything has more than one side, the visual artist and exhibition designer Krijn de Koning presents the art works in a series of no less than twelve separate galleries, passages and squares, which unfortunately remind the viewer more of the complicated mental gymnastics of scholastic theology (which Erasmus detested), rather than of the straightforward and eloquent educational theory that the humanist endorsed. While the distraction‑free, white spaces on which the paintings are presented constitute an inspired choice, the counter‑intuitive spatial order in which they are displayed will sometimes leave the viewer bemused. Perhaps it was the designer’s intention to break the visitor’s peripatetic inertia by luring him into a game of artistic hide‑and‑seek. The first gallery is entirely dedicated to Erasmus’ portraits. It is a rich, captivating space, filled by hand‑picked sketches, paintings and engravings. Symbolically, the opening display case presents a self‑portrait caricature made by Desiderius on the margin of a manuscript, dated c. 1515. Although the lines are hastily‑drawn in brown ink, it is touching to see that the great thinker was no stranger to self‑irony, as he drew his nose disproportionably large. To my admitted surprise, this small drawing was chosen as the symbol of all “Erasmus in Rotterdam 2008″ activities. It must be said that the Dutch authorities have exhibited admirable senses of humour and modesty — for, indeed, a nonchalant sketch by Erasmus himself carries more affective weight than the premeditated, almost solemn paintings done for him by Massys or Holbein the Younger. 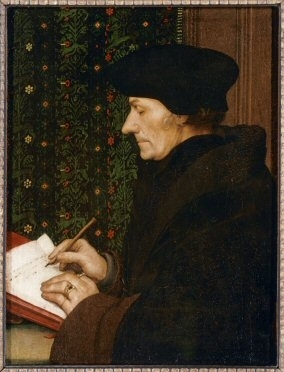 The latter’s famous 1523 portrait of the philosopher (usually found exclusively in the Louvre) presents the humanist in the privacy of a comfortably looking study, concentrated in writing and dressed in his usual clothes: a dark coat, a high fur‑collar and the familiar black beret; this last accessory is an artistic artifice used by his portrayers to counterbalance a sizable nose, and less of a fashion statement. Erasmus had a clear picture of how he wanted future generations to see him. After the long sought‑after papal dispensation of monastic duties in 1517, and already made world‑famous by his writings, he could benefit from a luxury available to monarchs alone — the honour of having his portrait taken by the greatest living artists of the time. Initially he associated himself with the image of the hard‑working intellectual, writing or meditating in a volume‑filled study. Later, sure of his position, he appeared without many additional attributes. A single book is often sufficient to denote his talents, as is the case with a recently discovered and never before exhibited portrait, which is attributed to Hans Holbein the Younger. Eventually, the beret and a cloistered smile are enough to make him stand out as Erasmus of Rotterdam, the most respected man of letters of the sixteenth century. Also in this section hangs a sublime Dürer engraving of Erasmus. Its details are magnificent, and we begin to understand why Desiderius compared him with the esteemed Hellenistic Greek painter Apelles. Around his subject, Dürer engraved pictures of heavy tomes, denoting the eternal character of the philosopher’s thoughts, while a vase of flowers hints at human mortality. When he grew older, as we may observe in a later Holbein portrait from 1533, one verse appositely concludes: “whoever beholds this portrait of Erasmus sees not the man but merely his old skin”. Fittingly enough, on display is also Hans Baldung Grien’s “Portrait of Erasmus on his Deathbed”. The face is painfully thin, the eye sockets are burdened and hollow, even the nose is clearly crooked — a detail that Holbein always smoothened over, but which Dürer or Grien never forgave. The first part of the exhibition successfully follows the intention of bringing Erasmus closer to us through images rather than words. However, things become more complicated as the visitor finds his way towards subsequent rooms. Throughout the next four sections, in order to fully appreciate the implicit stories behind the exhibited material, one has to constantly rely on more than the sense of sight. We are introduced to Erasmian influences on the iconography of St. Jerome. This Church Father, notable for his Latin translations of the Old and New Testament, but also well‑versed in classical secular literature, was adored by Erasmus as a model of linguistic and stylistic proficiency. In the second decade of the sixteenth century, Massys and Dürer are thought to have heeded Erasmus’ advice and depicted St. Jerome outside the usual canons. We may thus admire their innovative paintings of the saint, in which the traditional cardinal’s hat and the docile lion are absent symbols, while Jerome’s books, pen and a foreboding skull dominate the scene. Moving further along, we see fellow humanists — such as French intellectual, diplomat and royal librarian Guillaume Budé, whose portrait is one of the few paintings undoubtedly attributed to Jean Clouet — and a variety of scenes with scholarly undertones. In Pontormo’s “Two Boys with Books”, one can already observe the Italian’s brake away from High Renaissance classicism towards a more expressive, early manneristic personal style; the boys have their books closed and are apparently caught unaware by the painter’s brush. One of them is brusquely picking his nose, a habit which, unsurprisingly, Erasmus had insistently condemned in his pedagogical works. However, most poignant here is a selection of Desiderius’ personal belongings. A silver cup, an hourglass, beautifully ornate and with the sand still intact inside, and a wooden cutlery case suddenly turned the otherwise impersonal space into a refreshing reminder of Erasmus the man. These few relics leave the visitor longing for more Erasmian artefacts, and the next room half‑fulfils this desire, with its large, enclosed space dedicated to.. a laid table. Although not personally linked with Erasmus, sixteenth century table linen and tableware are generously displayed and commented upon, in relationship to the humanist’s pedagogical handbook De Civilitate. One may form a fairly good impression of how Erasmus preferred to eat and how he thought young people should wear themselves at the table, since the collection of napkins, serving dishes, tablecloths, salt cellars, drinking vessels, cutlery and toothpicks are well complemented by useful comments and Erasmian connections. Such connections fade away in the next main section of the exhibition, which is boldly entitled “War and Peace”. The unsuspecting visitors are succinctly informed that although Erasmus called for peace in a time when wars were the order of the day, he eventually climbed off the fence and admitted that the Ottoman wars were an inescapable resort in the face of pagan expansionism. This small discourse conveniently opens a door to decorate the following white spaces with profuse and sanguineous war scenes, Ottoman and non‑Ottoman alike, with genealogical representations of the bellicose House of Habsburg, and even with quite extraneous works such as a portrait of Suleyman The Great’s wife Roxelana, or Campagnola’s vicious “Battle of Naked Men”. The latter work would have indubitably abhorred Erasmus, for he was the most adamant pacifist of the millennium. Surely the organisers of the event know that biographers agree on the fact that never has he expressed outright approval of any contemporary or even hypothetical armed conflict; his stance on this was clear: “even when it is waged with perfect justification, no man who is truly good approves of it (war)”. The balance between Erasmus‑related Renaissance art work and simply war‑related pieces is precarious throughout this section. Dulce bellum inexpertis (‘War is sweet to those who have not tried it’) was one of Erasmus’ favourite classical adages. With a few exceptions, like the anonymous woodcut decorating a page of Erasmus’ Julius Exclusus, a violent satire against the war‑mongering pope Julius II, most pieces leave us wondering what the point of their displaying is, unless it is the fact that they are reminders of what the philosopher most sincerely loathed and wrote against. Images of Erasmus, Museum Boijmans Van Beuningen, Rotterdam (ANP). The last two sections of the exhibition, dealing with religious pictorial culture and visual representations of The Praise of Folly respectively, are fitted with much better chosen artworks. Visual correspondents of Erasmus’ written critiques of society and Church are abundant. Paintings such as Massys’ “Two Man Praying” ridicule the contrasts between outward actions and inward, authentic piety; of the two men presented to us, one is deep in prayer, while the other one seems unable to concentrate, despite holding a conspicuously large rosary in his hand. In what concerns the suitable representation of saints, Christ and the Virgin Mary, Erasmus was no iconoclast; he did, however, demand chastity, modesty and restraint as key pictorial hints. In this sense, Gossaert’s depiction of a sensuous, bare breasted, luxurious “Virgin and Child” would be, as the visitor’s booklet fittingly observes, an anti‑example of Erasmian artistic prescriptions. Quinten Massys’ restrained “Virgin and Child in a Landscape” or Dürer’s sober “Holy Family” are obviously more to the taste of our sensible humanist. Finally, The Praise of Folly is perceptibly explored. In his (in)famous satire, Erasmus lets nothing and no one escape the wit and vagaries of the personified voice of Folly: from obsessed pilgrims and sterile intellectuals, to vain monks and arrogant princes, all are bound together by human ludicrousness, imprudence or downright stupidity. Parallel to Erasmus’ work, the art of the early sixteenth century was also infused by iconographic innovations centered on satire. The subject of “unequal love” proved particularly popular, and Dürer’s engraving bearing the same title is only one example of numerous and eclectic works on display, many portraying attractive young women in the shady company of unattractive, rich men. Works of Lucas van Leyden or Cranach the Elder further capitalize on human pride, trickery, adultery, vice and naïveté. One thing prevents, though, the seamless integration of Erasmus’ Folly among these bluntly sarcastic artworks. The humanist’s text is so idiosyncratic and deliciously ambiguous, that its association with many straightforward and occasionally obscene paintings misses the mark. For we must not forget that under a fool’s voice, Erasmus speaks of Christ’s madness in embracing crucifixion for the sake of saving a depraved and unthankful humanity. This being said, it is also worth mentioning that Hieronymus Bosch’s “The Pedlar”, painted before Erasmus’ work was published, does rise to the mindful ambiguity of the humanist’s satire, as it leaves the viewer wondering if the pedlar in question has just thrown his money on whores, or if he is ironically surveying the foolish crowd so stoically left behind. add up to a remarkable result. However, visitors coming to Rotterdam will benefit from reading a book on Erasmus before. It will greatly enhance the experience.